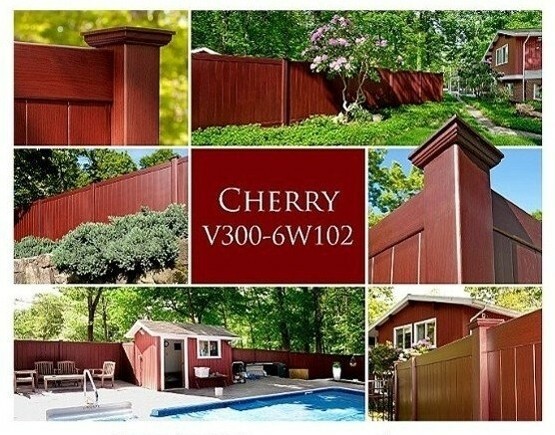 Shown here is Illusions WoodBond™ vinyl wood grain fence in Cherry. 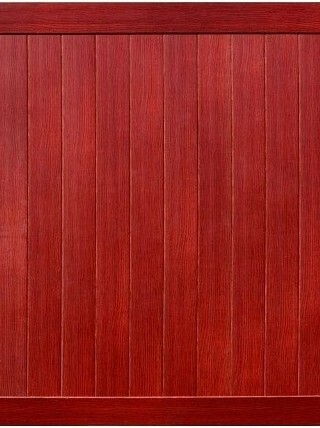 V300 solid privacy fence panels are in stock in the six foot height in any of the wood grains by Illusions™. Quick ship Illusions™ wood grain vinyl fence sections are ready for immediate delivery with matching posts, caps and a crowned top gate in your choice of the five vinyl wood grain finishes. Your Illusions™ wood grain, no maintenance vinyl fence can be in your driveway ready to install in 72 hours or less – please check our delivery service area. 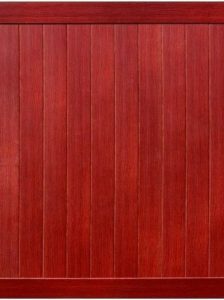 Illusions™Cherry wood grain as well as any of the other WoodBond™ wood grains are also available in all of the Illusions fence and vinyl railing styles as a special order which will require an approximate production time of two weeks.